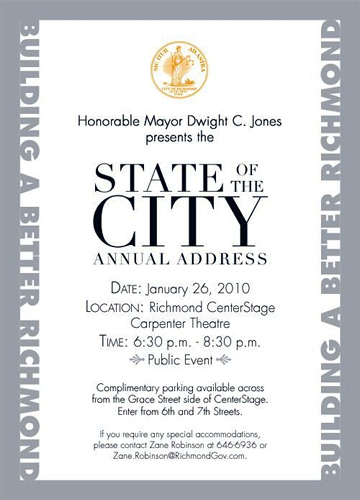 The Annual State of the City Address will be held on Tuesday January 26, 2010 at Richmond CenterStage, Carpenter Theatre from 6:30 PM to 8:30 PM. This is a public event that is free and open to everyone. Complimentary parking is available across from the Grace Street side of Center Stage. Enter from 6th and 7th Streets.